I was prepared to sleep in this morning, but the bed wasn't very good and I did wake up in time to watch the very end of yesterday's Australian Open coverage. That, however was as much due to the last match ending quite late down in Melbourne. It took a while, but the shower eventually raised hot water, and it was plentiful thereafter. 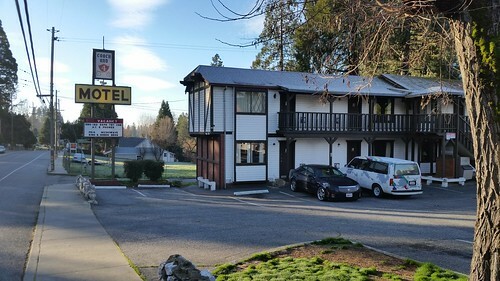 The room had only a shower stall, not a bathtub, which is one of several reasons I will not inflict it upon Lisa should we need to spend a night in Grass Valley again. More by coincidence than deliberate planning, I'd parked the Astro with the windshield pointed toward the rising sun, which is good because the windows had frosted over last night and by the time I moved out, it was much easier to scrape the remaining ice than it would have been had I been still in the shade. My room was in the low building in the middle, behind the white car. 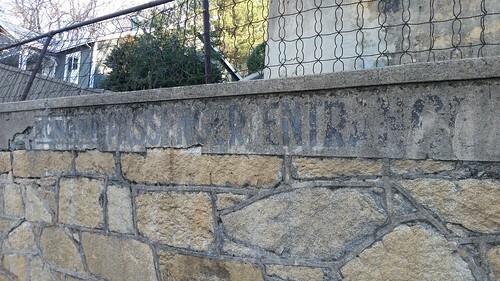 I had time to look around this morning after I checked out and before I had breakfast, so I sought out one of the last remaining bits of railroad history in Grass Valley. 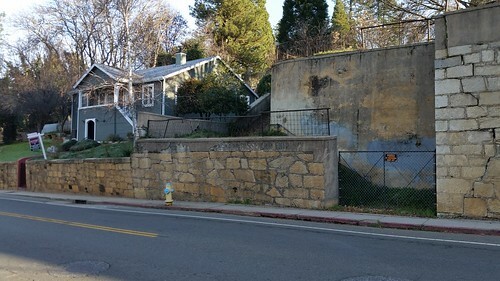 A short distance from downtown, in the shadow of today's CA-20/49 freeway that connects Grass Valley to Nevada City, is this stone retaining wall with a barely-visible sign showing that this was where one caught the train. The Nevada County Narrow Gauge Railroad ran from Nevada City to Grass Valley then on to Colfax where people and goods transferred from the 3-foot pike to the standard gauge Southern Pacific (original Central Pacific) line. 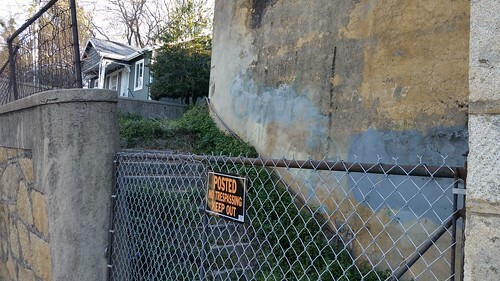 While the SP (now Union Pacific) is still in Colfax and two passenger trains each day call at there, the last regularly scheduled passenger train left Grass Valley in May 1938 and the line itself was torn up five years later. I had breakfast at Lumberjack's Restaurant (which is okay, but not as good as the Wigwam or Black Bear Diner). Rather than getting on the freeway, I ambled around surface roads (mostly old CA-20) the short distance to Nevada City. 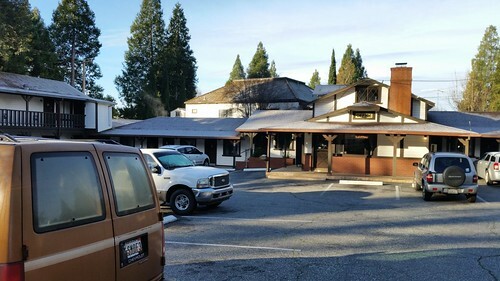 Lisa and I have meant to come spend a few days here exploring the area, probably sometime when we can stay at the hotel that is connected to the Nevada County Narrow Gauge Railroad Museum by rail. Along the way my phone buzzed at me. I pulled over to look at it. It was a text that purported to be an alert telling me my bank account was locked and providing a phone number to call. This sounded phishy to me, so I called Bank of America at their contact number (not the number in the text). Not to my surprise, they confirmed that there was nothing wrong with my account and this was a fraud attempt that I could safely ignore. With that, I got on CA-20 and headed west. While I hate driving this road at night or in bad weather, it's not bad at all when the pavement is dry and the weather good. I still can't keep up the pace that other vehicles want to set on this twisting mountain highway, but I use pullouts and get out of the way when I can. As I climbed into the mountains, snow appeared on the trees. Getting up to I-80 was a relief, and I stopped briefly at Cisco Grove. There's snow here, but really not enough for this time of the year. There should be more. We need it. Still, the ski areas higher up the mountain were open and from the traffic, seemed to be doing okay. 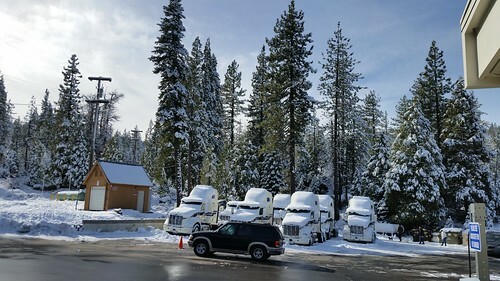 Caltrans had done their usual good job of getting the road clear and sanded, and I made good time from here onward back to Reno. 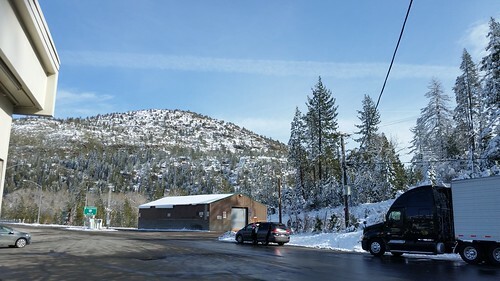 I had a couple of errands to run in Reno, and as I completed the last one, the clear sunny skies that I had at Cisco Grove and over Donner Summit had given way to gloomy gray. I was glad to get home. The forecast tonight is for snow, and while the roads are still open with no restrictions as I write this, should the predicted snow arrive, that won't last. This was my second time across the mountains in two weeks. I'm scheduled to do it again next weekend, weather permitting. At the moment, the long-range forecast looks good. We'll see what it's like in a few days.